Pius X High School offers over 100 courses in 12 different departments. The Math, Science, English, and Social Studies departments offer a total of seven Advanced Placement or AP courses. There are college preparatory and vocational courses available at Pius X to meet the various needs of students. 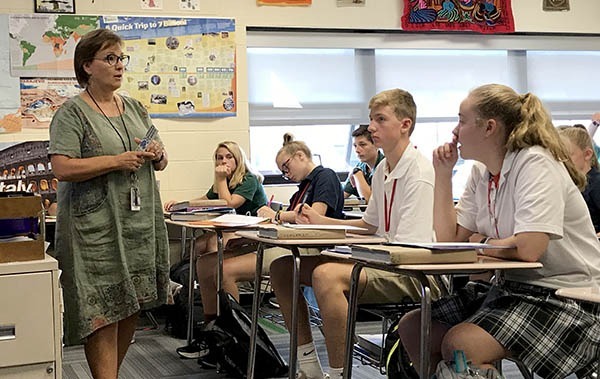 Ranking among the top 5% of all Catholic high schools in the country, Pius X provides an affordable, Catholic education in a positive environment. As part of the Pius X family, students deepen their faith and knowledge and have opportunities to pursue their talents and passions. Support programs are in place to help individualize the opportunities for students regardless of their situation. Our guidance department works in conjunction with teachers to meet the needs of our students. 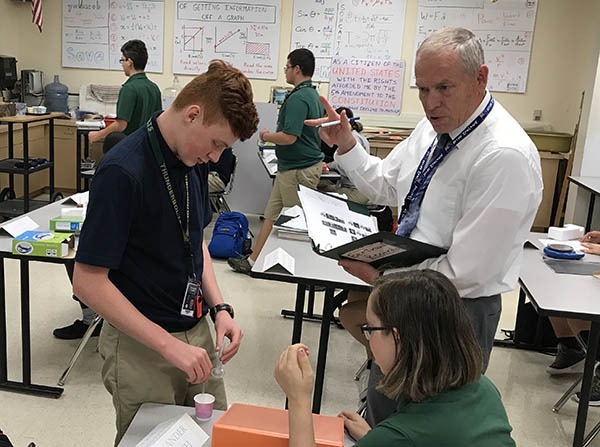 Teacher Jim Bertrand answers students' questions about their project in a science class. Pius X uses a two semester system with courses being either one semester or two semesters in length. Students receive five credits for each course passed at the end of each semester. Each semester has approximately 90 school days. Days are divided into eight traditional periods that meet for 46 minutes each. An official Pius X transcript is a copy of the student’s confidential, cumulative scholarship record. The transcript carries the raised school seal along with the date of issuance and the signature of a school official. Authorized recipients of a transcript may not release any information unless they have obtained prior written consent of the parent or an 18-year-old student. The ABLE program assists students who struggle academically by providing support and learning strategies. SCIP is an intervention program which identifies, educates and supports the individual student in regard to substance abuse and/or other personal needs. Students learn about the Earth's crust and inner core in a Social Studies class.